trapped in the ice in 1876. Type and Characteristics - Single screw, wooden-hulled sloop (one of six "First-class" sloops, designed by Isaac Watts, Chief Constructor), hull built at Pembroke Dockyard 1856, towed to Chatham Dockyard for completion, 751 tons (builders measurement), 160ft long x 32ft beam, low power horizontal engines for harbour use, 17-32pdr smoothbore guns, 175 crew. Converted for Arctic exploration in 1874, re-engined with Hawthorn compounds, and re-boilered to 60psi, armament 4-Armstrong breach-loaders, hull strengthened with iron, sheathed with teak above water and elm/Pitch-pine below. Log Period and Area of Service - 1884, Greely Arctic rescue mission. 1884 - The 1881-83 Expedition commanded by First Lieutenant Adolphus Greely, US Army was one of two setting up observation stations in the Arctic. 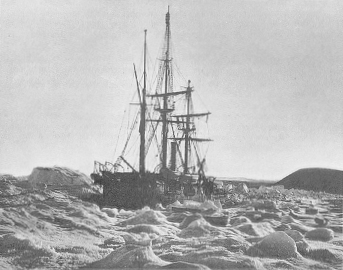 Greely's was left stranded in the Arctic over the 1883/84 winter. In 1884, the US Navy organized a small rescue fleet consisting of USS Bear, USS Thetis (both later transferred to the US Revenue Service) and the loaned HMS Alert. HMS Alert was placed under the command of Captain George W Coffin USN on 20 February 1884, and set up supply dumps to support USS Bear in her rescue of Greely and the other survivors. Fate - Transferred to Canadian Government service in May 1885, laid up 1894, and shortly sold.